If so, this book was written for you! "I applaud this sagely-seasoned writer for giving us an accessible, eminently-pragmatic, and spiritually-oriented guide for reclaiming our lives. Bravissimo!" “If you want relief from your current busyness dilemma, read this book! 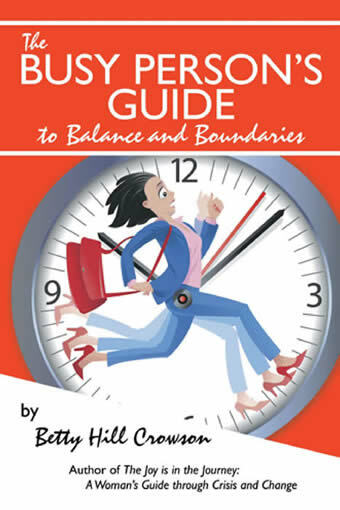 The Busy Person’s Guide to Balance and Boundaries provides a clear, efficient, and effective pathway for establishing boundaries and recovering physical, emotional, and spiritual energy. At the same time, its workbook format guides us easily through a process of improving and deepening relationships, with ourselves, others, and a Higher Consciousness with which we yearn to connect. Based on years of working with individuals, couples, and groups, and expertise in the areas of spirituality, psychology, and recovery principles, the wisdom imparted simply and honestly throughout these pages is nothing short of profound. Betty Hill Crowson has given us a roadmap to recover our true selves at our own pace, empowering us to make the giant leap from human “doing” to a happier, and infinitely more content, human being. Also available wherever you prefer to buy books! "Betty Crowson and her work are clearly a godsend to women everywhere. The Joy is in the Journey is a simple, yet profoundly wise and practical guide to living fully and healthfully." Finally! Directions for life and its many changes! How do you deal with the many changes in your life? You know, those things, big and small, desired and not, that continually shift the status quo. Relationships come and go. Jobs appear and disappear. You move, get sick, get married/divorced, and have children who grow up and leave home. When change happens, what do you do? Do you immediately become immobile and overwhelmed, wondering what to do next? Or do you move iinto frenzied activity, often making poor or self-destructive decisions? Perhaps you play the blame game, thinking “When am I ever going to learn?” - or - “How could he/she/they have done this to me?” And what about those life changes that bring you face to face with your biggest fears, or the ones that catapult you into such grief and despair that you think you’ll never see the light of day again. How do you cope? 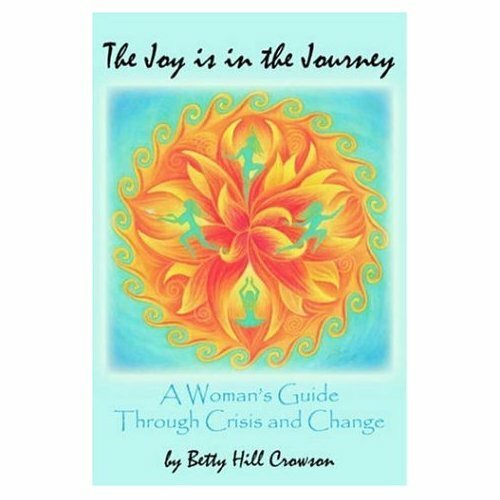 The Joy is in the Journey: A Woman’s Guide Through Crisis and Change provides powerful answers for all of these concerns. Written by Betty Hill Crowson, holistic life coach, retreat director, and motivational speaker, this book is chock-full of the “transitional know-how” that women have long been looking for. Finally – directions for not only coping with the curve balls that life can throw, but also a blueprint for choosing and making positive changes in every area of our lives. This is no ordinary self-help book. For one thing, it doesn’t spend time reiterating the problem ad nauseam. Instead, the book provides a step-by-step, easy to understand (no psycho-babble) “process” that empowers women to navigate through the ups and downs, the challenges and complexities, of their many life changes. Betty Hill Crowson outlines eight specific solutions that give detailed instruction on how to do such things as accept ourselves in any and all conditions, create more balance in our lives, learn to let go, determine what action to take and when, break the cycle of doing the same old thing over and over while expecting different results, and much, much more. Her wisdom and personal writing style make you feel as if you have your own personal coach rooting for you and understanding how you feel. She ends each chapter with a list of suggestions for putting newfound awareness into action; action which results in changed behaviors, increased freedom, attitude adjustments, and yes, as the title implies, greater joy in the journey. This "how-to" treasure is not to be missed. It also makes a great gift! "As a psychotherapist, one of my roles is to "help others to help themselves." Betty Crowson's book is the perfect adjunct to this therapeutic process. The Joy is in the Journey enables my clients to continue working through his/her issues inbetween the weekly sessions. They have benefitted tremendously as a result of this additional help. What a gift!